From Science to Sales is the sales training and coaching approach that is specifically designed for scientists in sales roles in the Life Sciences and Biotech industries. This approach helps your sales teams make a successful transition from being scientists to being sales representatives – and to enjoy what they are doing! After all, we are only really successful at what we enjoy doing. Why choose From Science to Sales? My aim is to help individual sales reps, sales managers and whole sales teams on their way “From Science to Sales”. The best way to learn a foreign language is to choose a teacher who speaks both the language you want to learn and your mothers tongue. The same is true if you want to change between two fields that are as fundamentally different as science and sales. The chances for success are much higher with a teacher who speaks the language of scientists and can teach the language of sales. I have been trained as a scientist and then moved into sales for many years. Over the course of several years I have learned the language of sales, have fought the same battles, and struggled with the same challenges as your employees. In the end I have created my own way of becoming a successful sales rep and sales manager. Without help from trainers and coaches throughout the years this path would have been much rougher. Customized trainings target the specific needs of your team and your company. 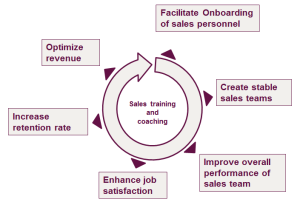 Regular trainings increase the retention rate of your sales personnel. I will help with onboarding and training of new sales personnel. Higher employee satisfaction in your team will increase loyalty and performance. Build a stable team where everyone works towards a common goal. Sales training will ultimately lead to higher revenue.